The LCA offers internships to motivated students or professionals in the early stages of their careers desirous to learn about arbitration and alternate dispute resolution, and practical work experience skills. During their time with the LCA, interns shall principally assist the staff members in discharging their day-to-day duties. Under supervision, interns will be assigned tasks and projects relevant to their educational background and interests, and they will be provided with opportunities to develop theoretical and practical knowledge of the functions of an arbitral institution. Where appropriate, the LCA encourages its interns to exercise initiative and engage in independent thinking. interact with the LCA’s national and international membership network. The LCA interns shall be challenged intellectually and will gain insights into managing multiple projects, functioning to meet tight deadlines and within a small team of highly qualified professionals. The practical work experience and skills acquired shall be very useful to operate effectively in any professional environment and in the next stages of their careers. In order to maintain the highest standards for interns and despite the strong interest shown, the programme only provides for three interns at a time. Internships are offered all year round and are generally for periods of 6 weeks to 3 months; longer durations maybe considered in exceptional circumstances. As the LCA Internship Programme is aimed at candidates in the final stages of their studies; practical experience is not an essential prerequisite for selection, however relevant work experience maybe considered as an advantage. be available to work on a full-time basis for the period of the internship. Applicants from all over Nigeria and abroad shall be considered. LCA Internship Programme offers no remuneration and overseas applicants should note that the LCA shall not cover the cost of any travel or accommodation associated with the internship. The LCA shall reimburse interns for any out of pocket expenses incurred directly as a result of research work, such as the purchase of research materials, as well as travel and food expenses (receipts will be required). Two references (one academic).. .
All applications should be compiled with clear references to the criteria set in the ‘Eligibility Requirements’ and provide as many examples as possible. 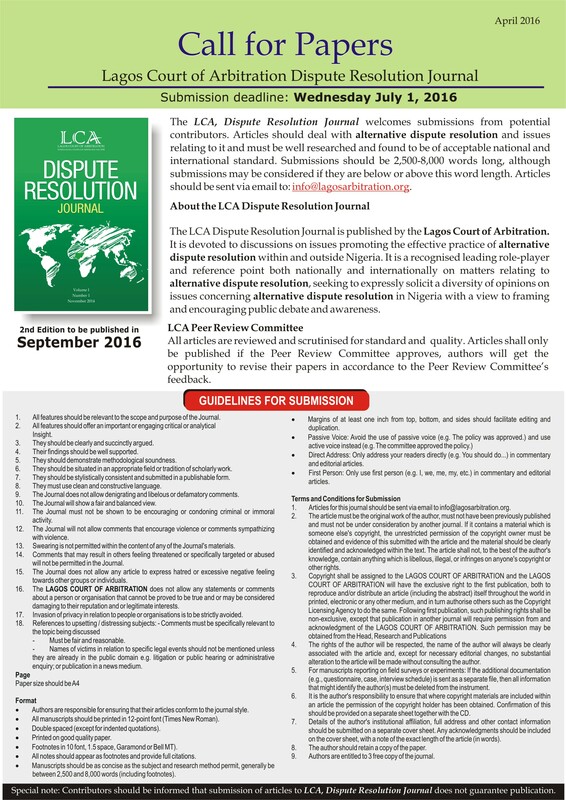 Applications can be submitted either via email to Info@lca.org.ng in a single PDF file or in a portfolio (hard copy) addressed to International Centre for Arbitration & ADR, Lagos Court of Arbitration, 1A Remi Olowude Street, 2nd Roundabout Lekki-Epe Expressway, Okunde Bluewater Scheme, Lekki Peninsula Phase 1 (Atlantic Side), Lagos, Nigeria. Incomplete applications shall be rejected due to inadequate submission. Rejected applicants can reapply for internship after 12 months. Applicants are required to attend an interview (either in person or via video conference) and a written assignment before offered an internship. The LCA Internship Programme is highly competitive because of the unique opportunity to be part of one of the most progressive and innovative institutions in Nigeria and on the continent of Africa. The quality of the application is very important as the LCA requires interesting candidates that are confident, adjusted, flexible and original. Successful candidates are able to effectively articulate not only what they desire from the internship, but also how they can add value to the mission of the LCA. It is recommended for applicants to apply for an internship placement 6-12 months in advance of the desired start date.